Armament: Two 0.303 inch (7.7 mm) Vickers machine guns, one or two 0.303 inch (7.7 mm) Lewis guns and four 25 lb bombs. Dolphin Mk I: The main production version was powered by a geared 200 hp (149 kW) Hispano-Suiza 8B engine. Dolphin Mk II: Manufactured under license in France. Powered by a direct-drive 300 hp (224 kW) Hispano-Suiza 8F engine. Dolphin Mk III: Powered by a direct-drive 200 hp (149 kW) Hispano-Suiza 8B engine. The Sopwith 5F.1, nickname the Dolphin, was a single seat British fighter aircraft manufactured by the Sopwith Aviation Company. 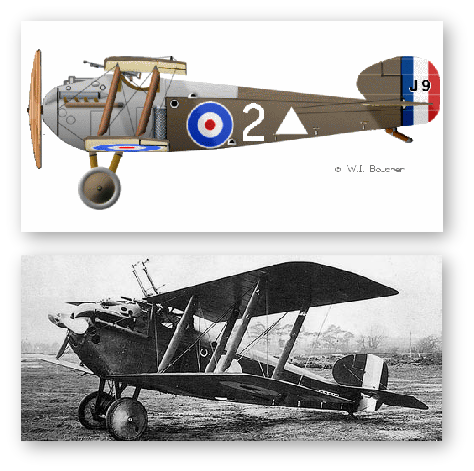 It was used by the Royal Flying Corps and its successor, the Royal Air Force, during the First World War. The Dolphin was regularly seen at East Boldre and entered service on the Western Front in early 1918. It proved to be a formidable fighter but was retired shortly after the war. The upper wings were attached to an open steel cabane frame above the cockpit. To maintain the correct centre of gravity, the lower wings were positioned 13 inches forward of the upper wings. The pilot sat with his head raised through the frame, where he had an excellent field of view. This sometimes caused difficulty for novice pilots who found it difficult to keep the aircraft pointed at the horizon because the nose was not visible from the cockpit. The normal armament of the Dolphin was two fixed, synchronised Vickers machine guns and two Lewis guns mounted on the forward cabane crossbar, firing at an upward angle to avoid the propeller. The mounting provided three positions in elevation but limited sideways movement. The Lewis guns proved unpopular as they were difficult to aim and tended to swing into the pilot's face. Pilots also feared that the gun butts would cause serious head injuries in the event of a crash. Most pilots therefore discarded the Lewis guns, though a minority retained one or both guns specifically for attacking high altitude reconnaissance aircraft from below. The Dolphin also carried four 25 lb bombs. The French-built Hispano-Suiza 8B engines were unreliable and, before 1918, were in short supply. This proved to be a serious problem in the deployment and use of the Dolphin. Insufficiently hardened metal in the pinion gears led to numerous failures of the reduction gearing, particularly in engines built by the French firm Brasier. The engine also suffered persistent lubrication problems. Limited production capacity for the Hispano-Suiza engine and the priority given to French aircraft like the SPAD S.XIII slowed Dolphin deliveries. Availability of the Hispano-Suiza improved in early 1918 as the French firm Emile Mayen began deliveries on an order placed by the British Admiralty.